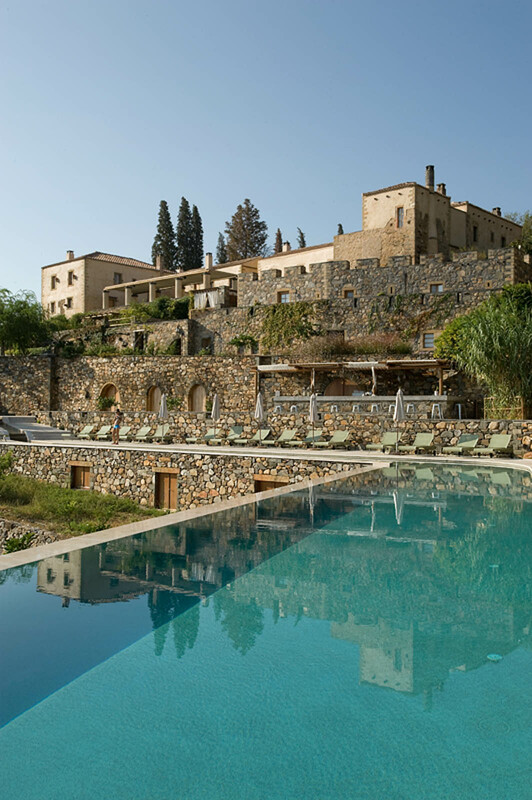 Kinsterna Hotel in the hills of Monemvasia is a truly amazing place. 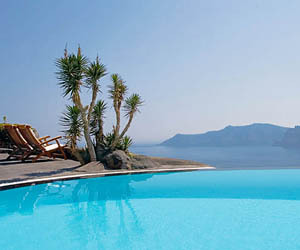 I have seen a lot, and to me this is definitely one of the most beautiful luxury hotels in Greece. 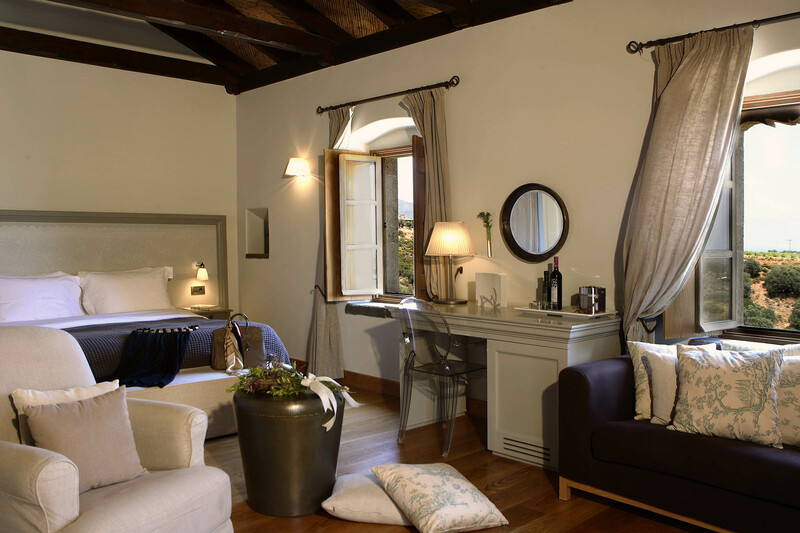 The main building is an immaculately restored 13th century manor. 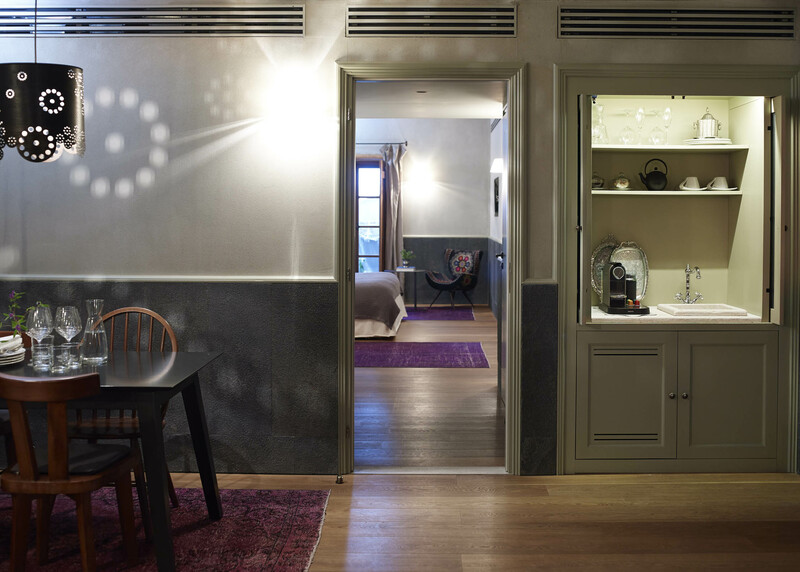 Its historical character is celebrated in every detail, and jazzed up by some striking modern elements in the interior design. 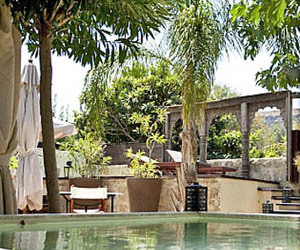 Spring water snakes through the property, into the partially covered old cistern in the central terrace, and on towards a long L-shaped swimming pool surrounded by fruit trees. 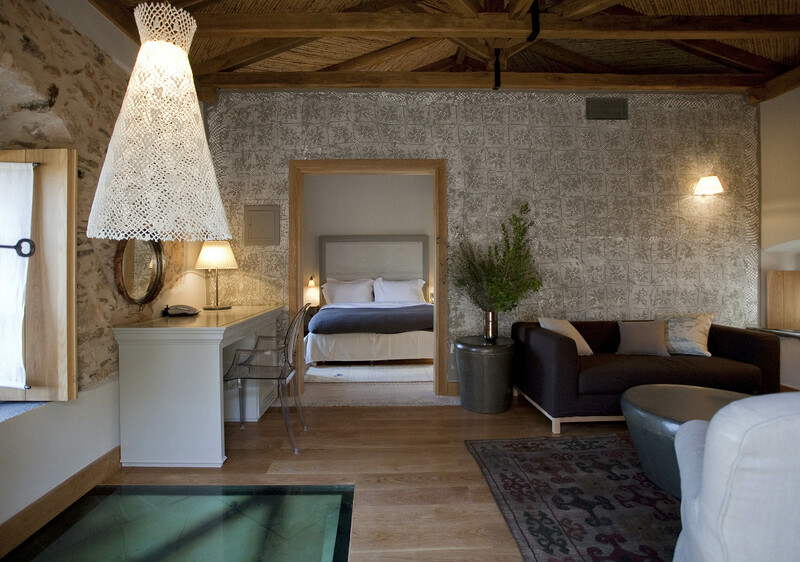 With three-dimensional lace stencilling on the walls, each one of the luxury rooms, suites, residences and even villas impresses in its own way. 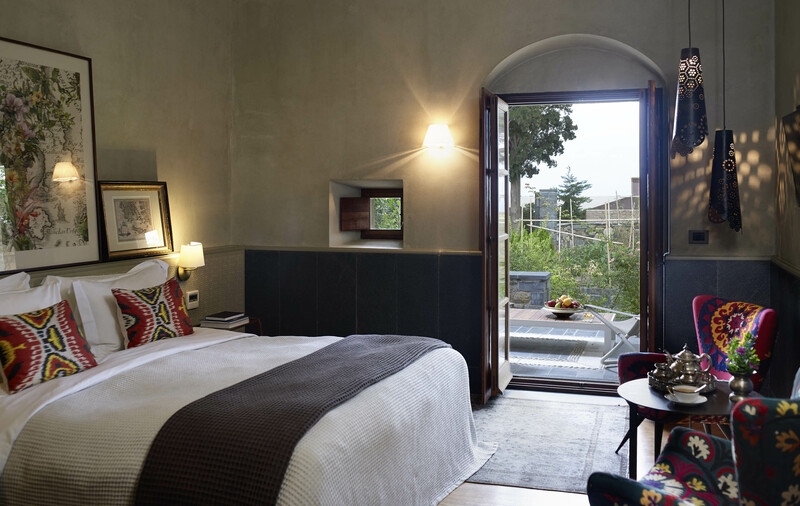 In the oldest parts of the Kinsterna property, cosy “Byzantine” suites have dome-shaped ceilings. 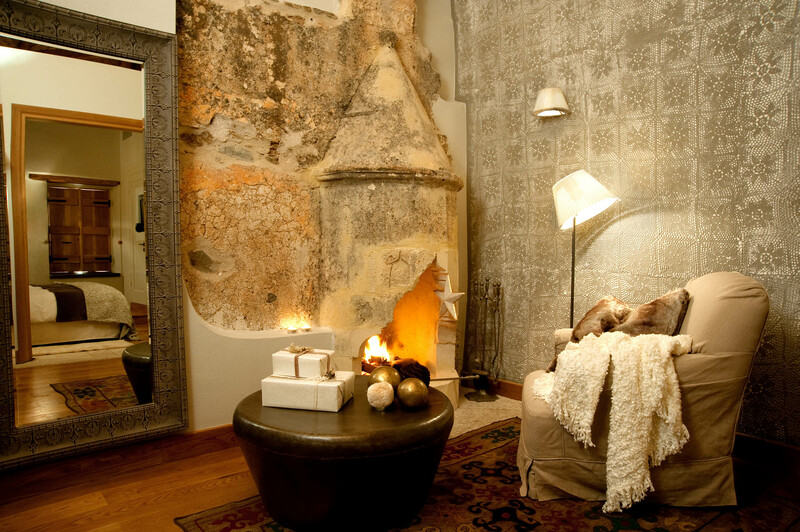 Others have unique features: an original Ottoman fireplace in one, the old dungeon (!) in another. 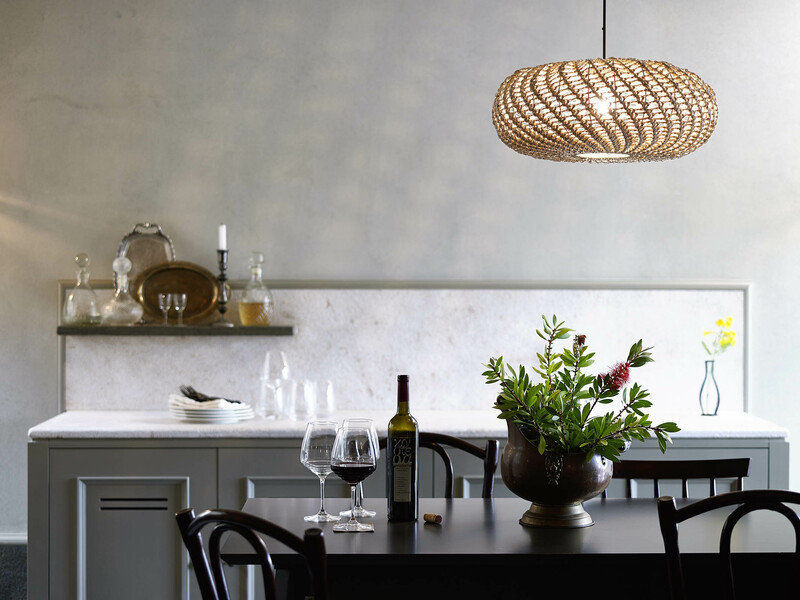 Newly added residences have the charm of the old with a few modern twists. 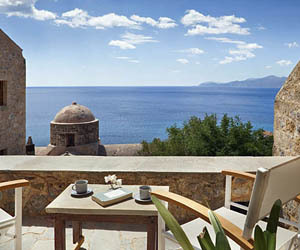 I stayed in an impressive top-floor suite looking out over the hills, the sea and the castle rock of Monemvasia. 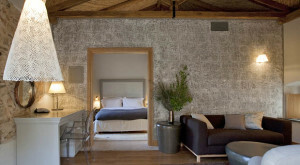 I slept in an incredibly comfortable bed and showered in a luxurious marble bathroom. 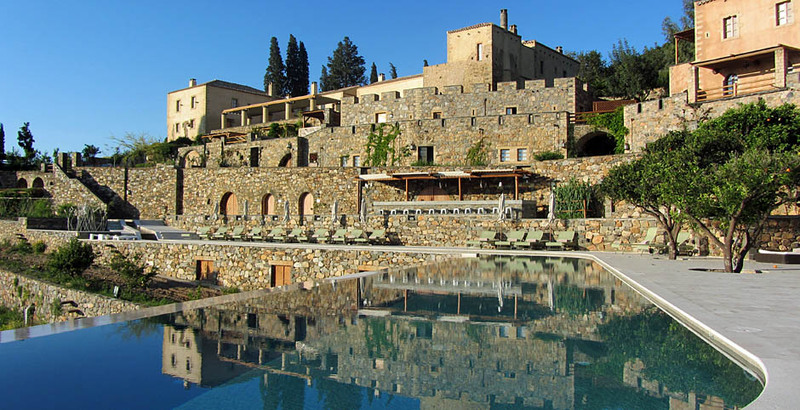 That, and the amazing food, was plenty of indulgence for me, but there also is a top-notch spa and a fantastic swimming pool to tempt you. 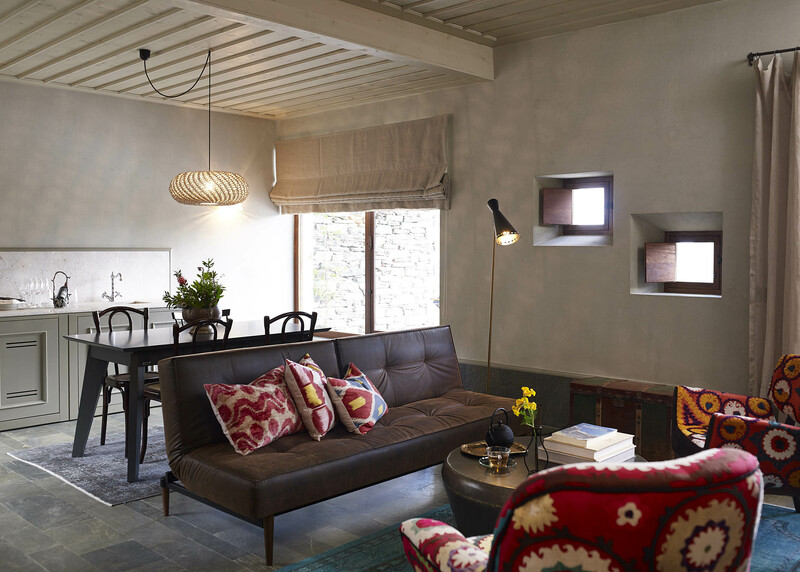 In a place like Kinsterna Hotel, aesthetics, luxury, gastronomy and service of the highest level are a given, but the calm atmosphere, the friendliness and the beautiful historical details throughout the property made it memorable to me. Can I be a bit childish? I didn’t like it that when I arrived at Kinsterna Hotel I had to announce myself through an interphone before the gate was opened, and I felt a little embarrassed when they came with a golf cart to take me from the parking area to the reception. 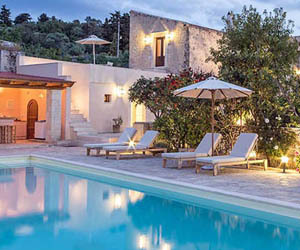 The two villas share a swimming pool. 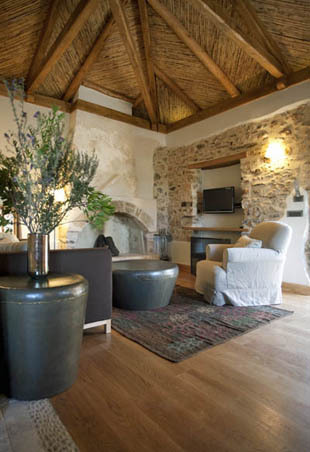 Prices for two persons from 120 Euro per night (for a minimum stay of two nights), breakfast and taxes included. 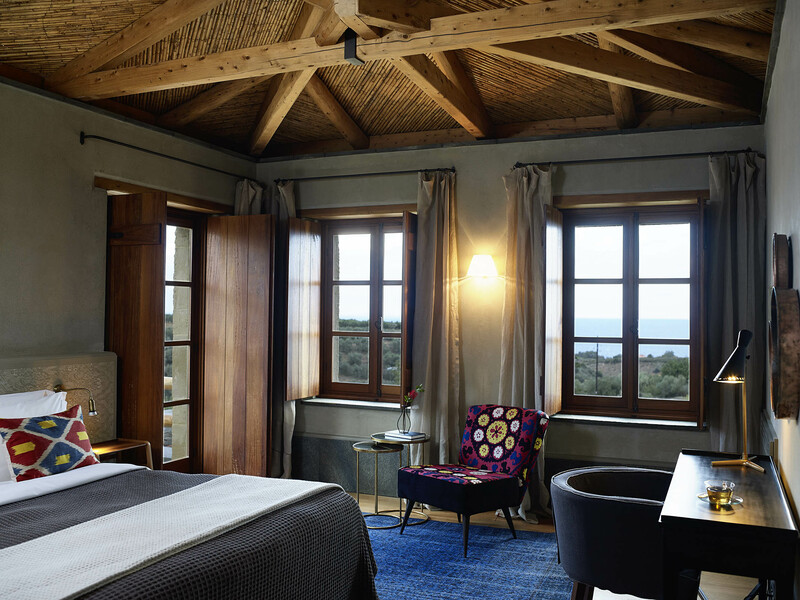 For a full overview of room rates, please check the website of Kinsterna Hotel or contact them. 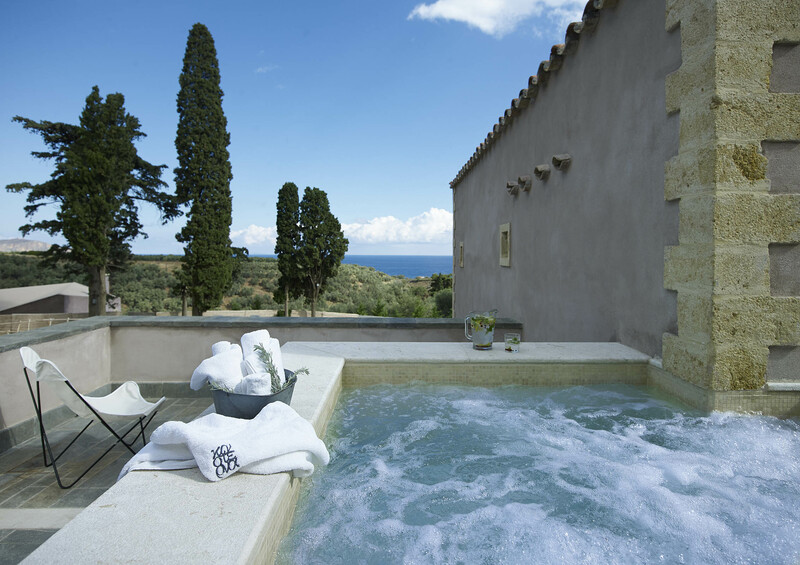 Kinsterna Hotel has its own olive trees, organic vegetable gardens and fruit trees, and you can expect lots of fresh seasonal produce on your plate. 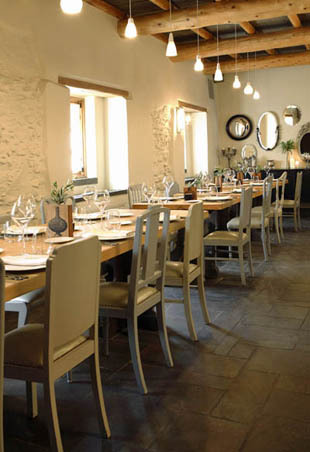 Breakfast is served between 8 and 11 am – you can either help yourself from a buffet, or order à la carte. I didn’t find it easy to choose as I was tempted by almost everything on offer: cheese pies, eggs, crispy bacon, all sorts of bread, crepes, waffles, yoghurt, fruit salad and more! 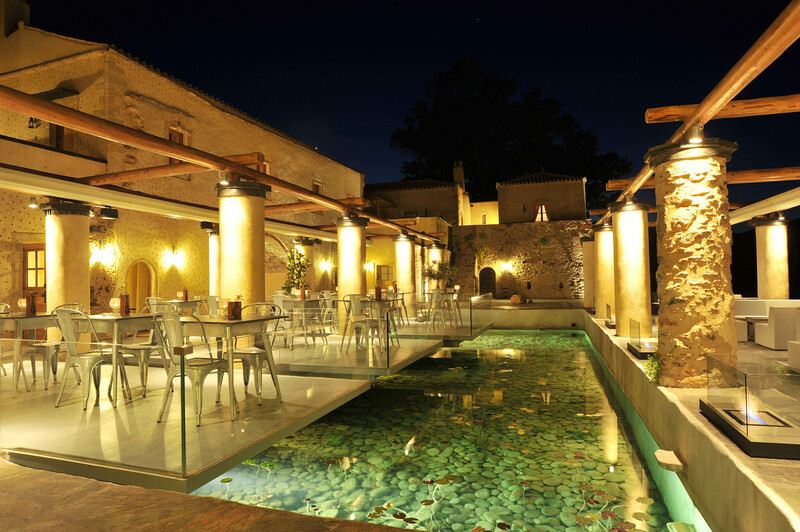 The gastronomic feast continues throughout the day and evening. 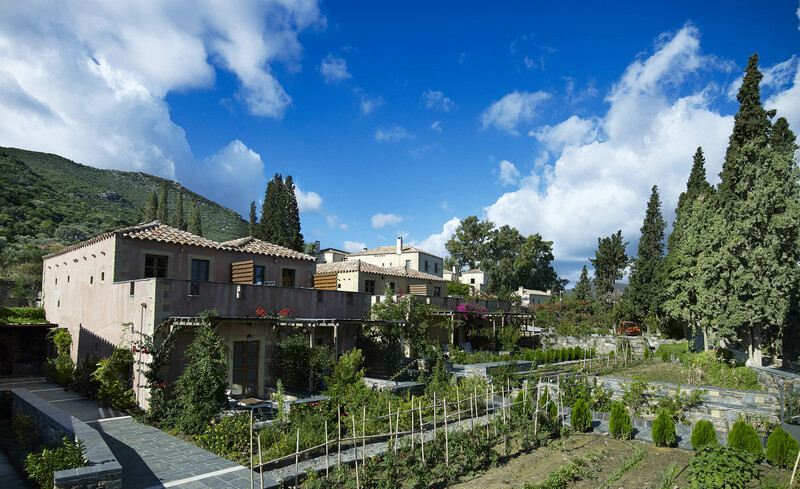 The “All Day Restaurant” serves local specialties prepared with garden vegetables and fruits, free range meat and other local products. 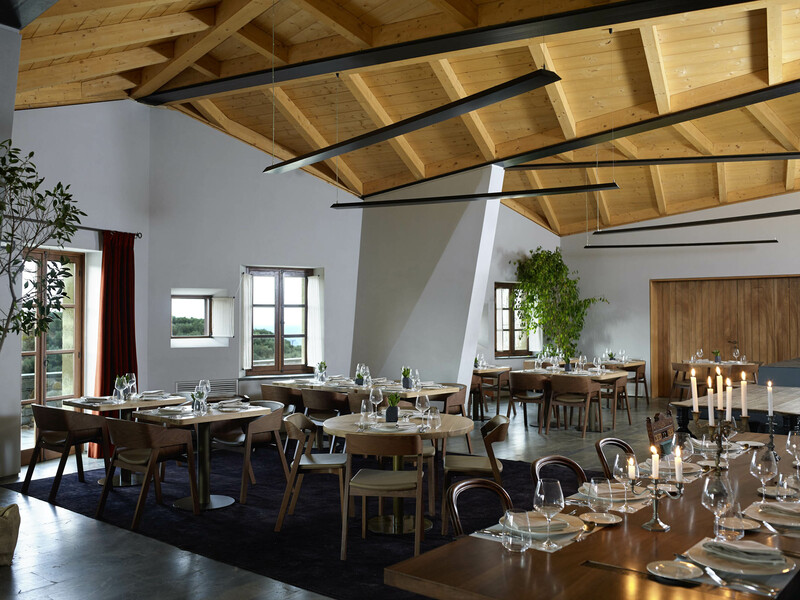 For an even more refined dining experience, the “Kinsterna Restaurant” offers a seasonally varied gourmet menu. I can’t remember what exactly I had for dinner, but I do recall it was a lot, and really delicious! As was the wine, from Kinsterna’s own vineyards. Children are welcome at Kinsterna. 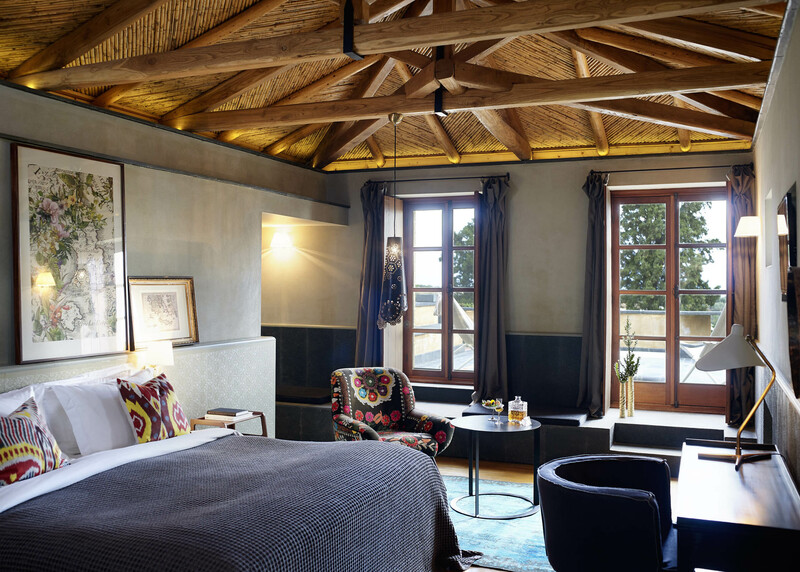 Even though the hotel is the perfect luxury destination for romantic escapes or spa breaks for couples, it is also family-friendly, and the larger suites and the villas are well laid-out for family holidays. 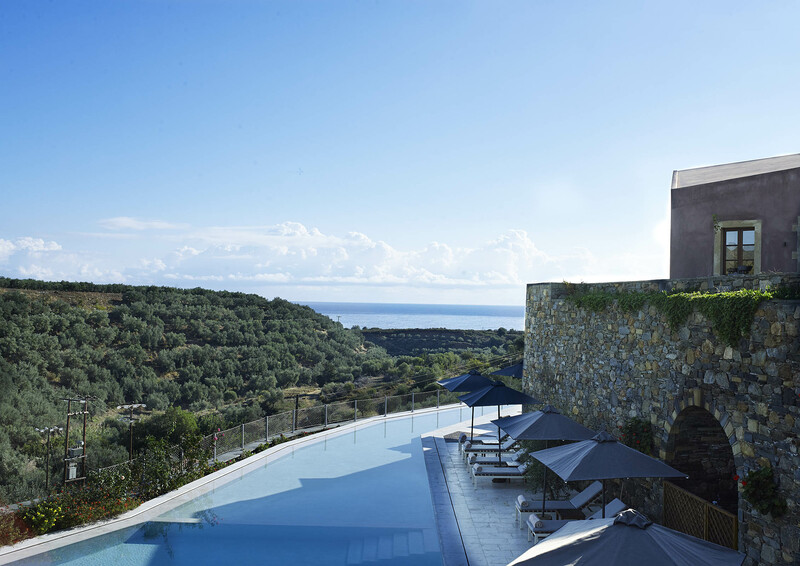 Your children will definitely enjoy the swimming pool, donkey rides, stargazing, gardening, walks through the hills and swimming at nearby beaches. 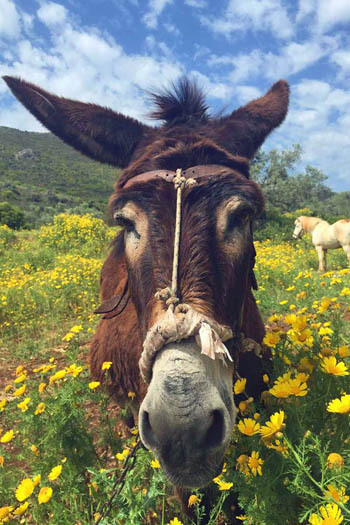 They can also ride bicycles, help with the olive harvest in the autumn and pet farm animals. 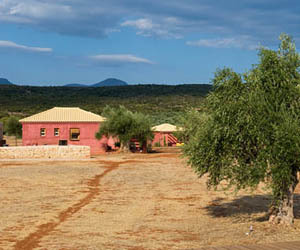 There is an outdoor playground and an indoor playroom with boardgames and toys. The hotel also offers babysitting services on request. 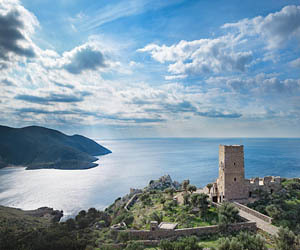 Explore the castle city of Monemvasia: stroll through the cobbled lanes, climb up to the ruins on the 6th century castle, dip into the sea from one of the rocks, and check out the little shops and cafés. Go and explore, on foot. 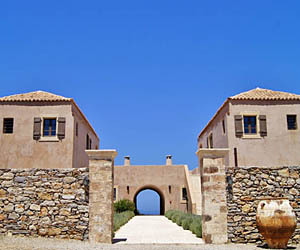 There is a network of trails and paths around Monemvasia, and many walking routes are signposted. Ask the hotel for a map. 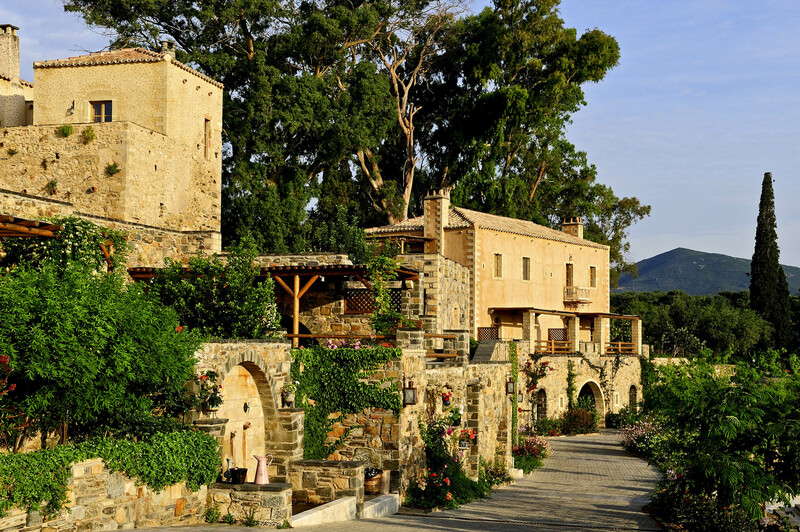 One beautiful six km walk takes you from Kinsterna through olive groves, hills and mountains, past gorges, streams and small waterfalls to the village of Koulentia (Elliniko on the map). 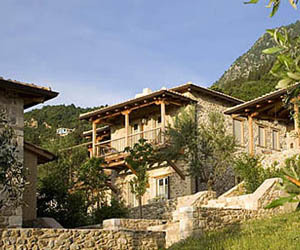 There’s also a fantastic ten km hiking route by the sea, starting from Agios Fokas and ending at the cave of Kastania. Walk, cycle or drive down to the sea (2 km) – there are several small sandy beaches. A short drive north, about 15 minutes, Kastraki is one of the better local beaches. 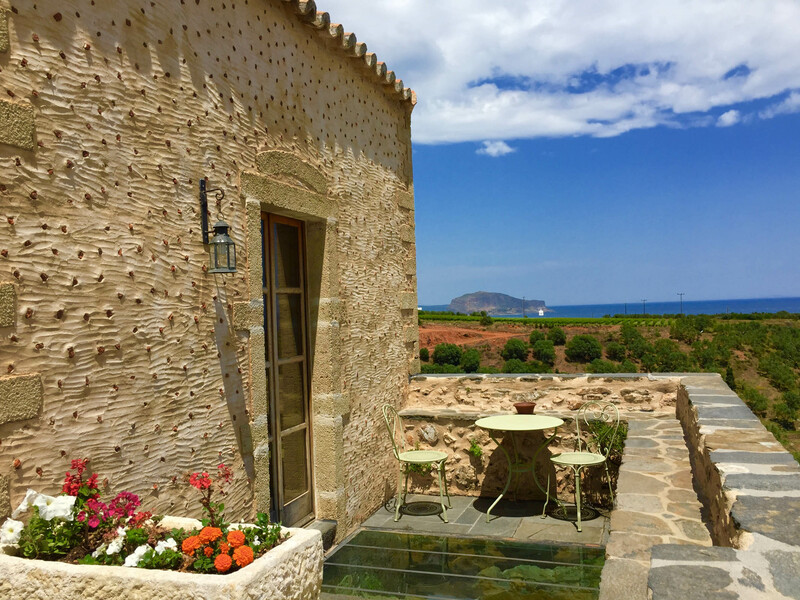 For a real beach treat, plan a day excursion to the island of Elafonisos. A beautiful 50-minute drive over the mountain, a ten-minute ferry crossing and a less-than-ten minute drive on the island and you’re on Simos beach, famed for its fine white sand and lagoon-like waters. 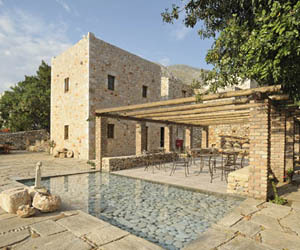 Local guides organise trips, and take small groups around the rock of Momenvasia and beyond, snorkelling and picnics included. 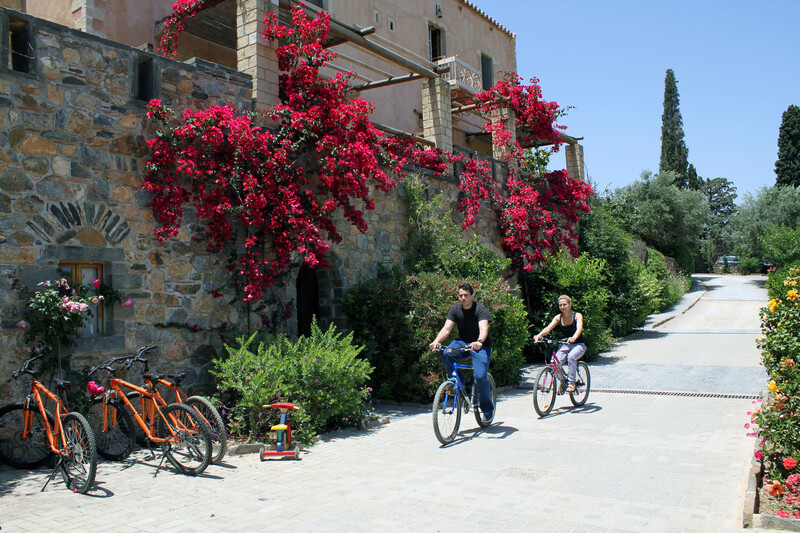 Grab a bicycle and cycle to the rock of Monemvasia or follow tracks and country roads to explore the coast and the countryside. 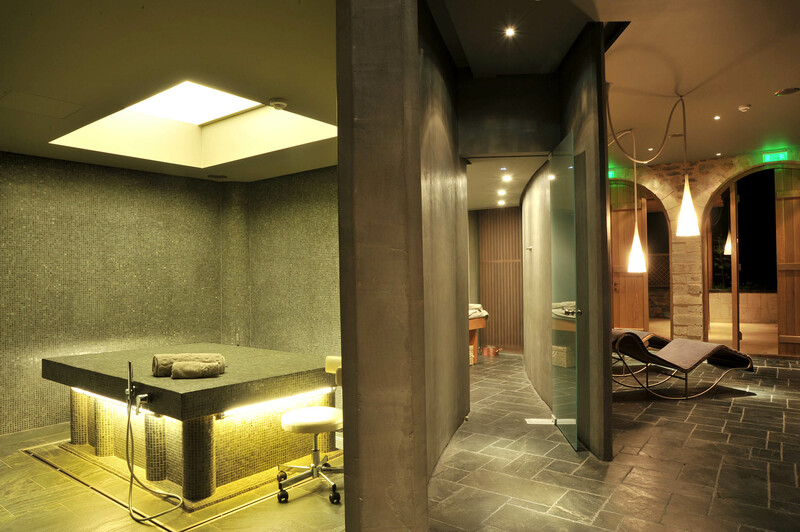 Treat yourself to a fantastic full-body massage in the spa. 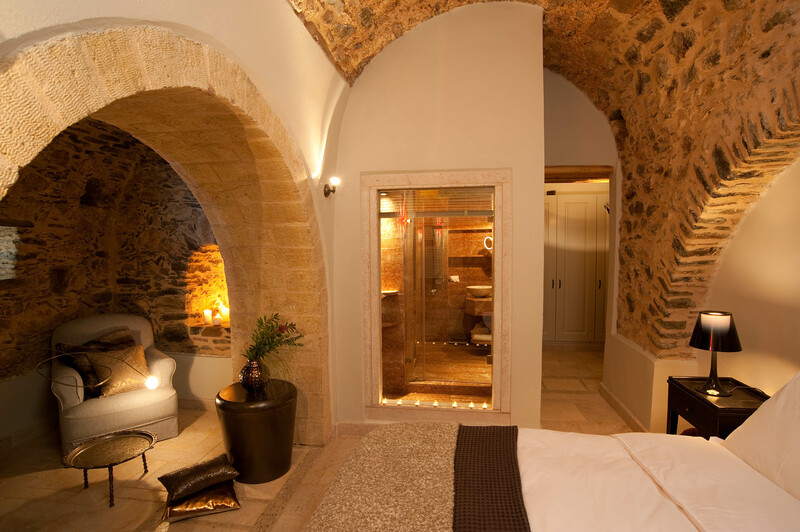 The ‘menu’ also features facials, body treatments, manicure, pedicure and hydrotherapy. 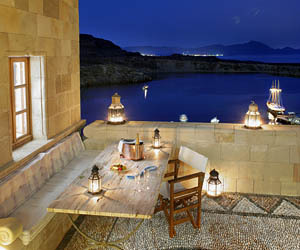 Conclude with a drink in the outdoor Jacuzzi with views over Monemvasia. Oh bliss! 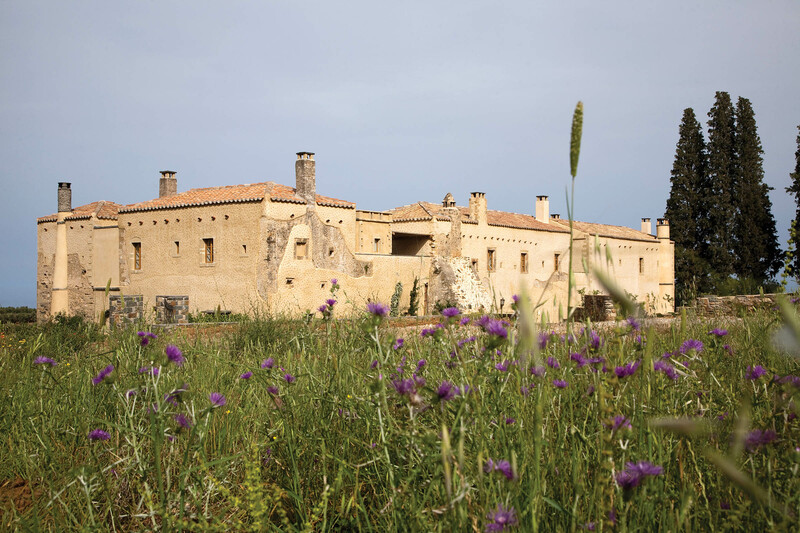 vest (between October and December) you can watch how organic olives are cold-pressed in the historical stone mill to produce fresh olive oil (agoureleo), and help bottling olives following Kinsterna’s own recipe. 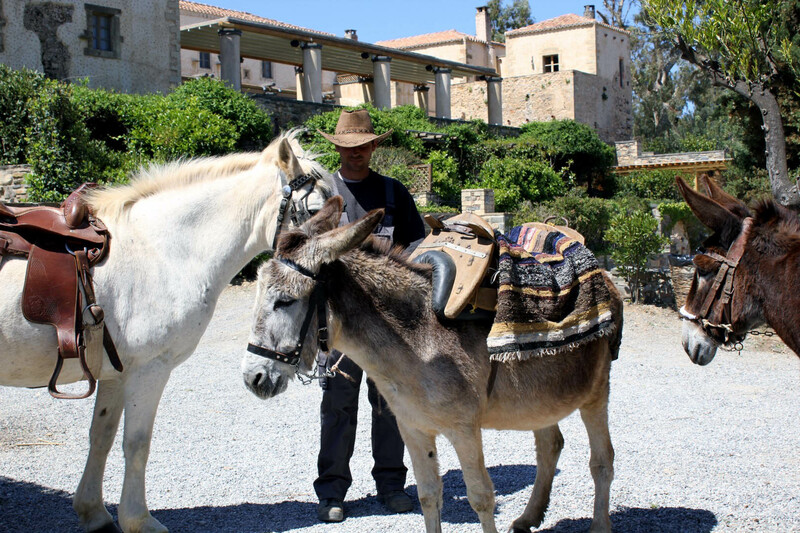 Take a donkey ride, or a ride in a horse-drawn carriage. 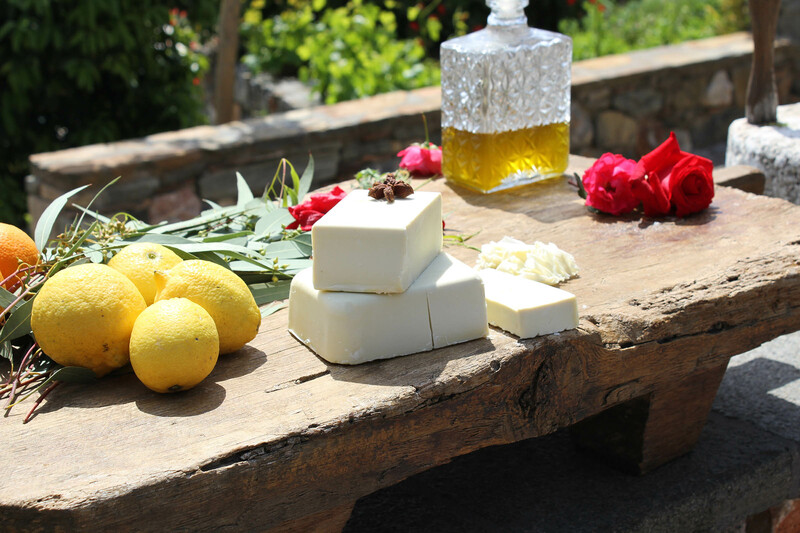 Learn how to make soap (seminars organised in spring). 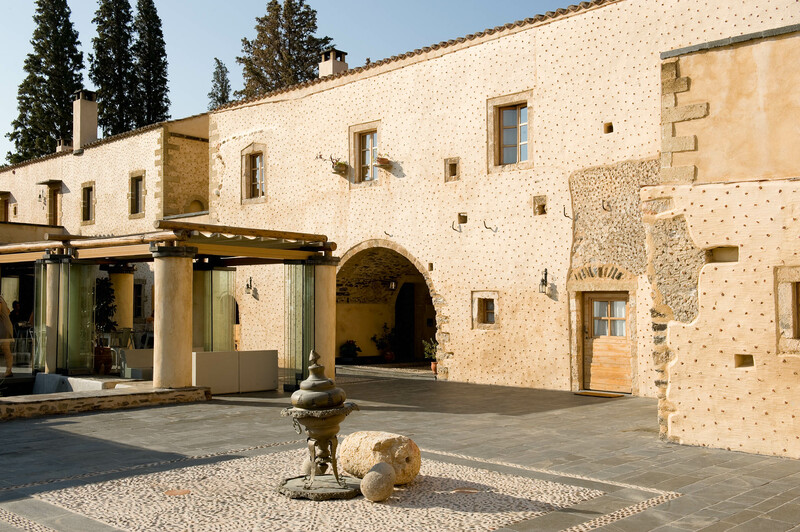 Sign up for a private wine tasting session to learn about local grape varieties and sample the finest regional wines. 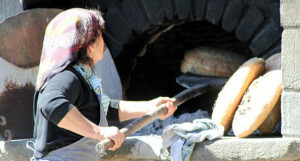 Learn to how make bread in a traditional wood-fired oven. Try your hand at the weaving loom. Or sign up for a fishing trip. 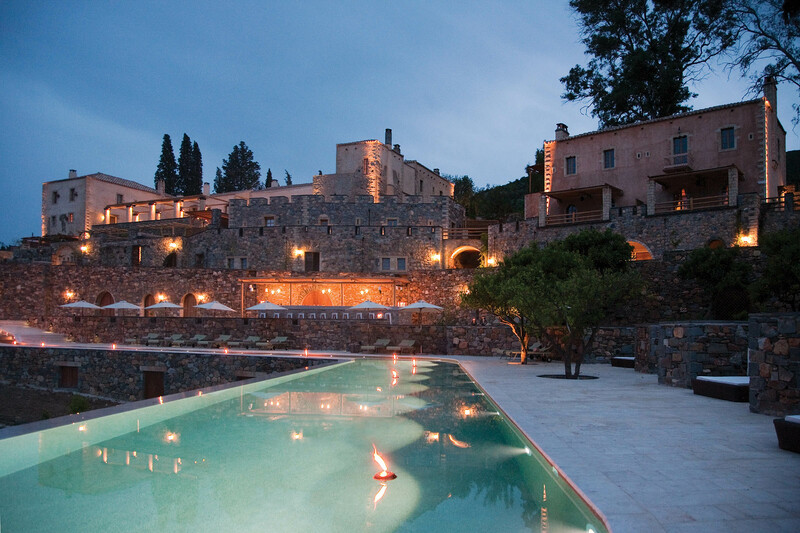 Kinsterna Hotel is only a few kilometres away from the castle rock of Monemvasia. 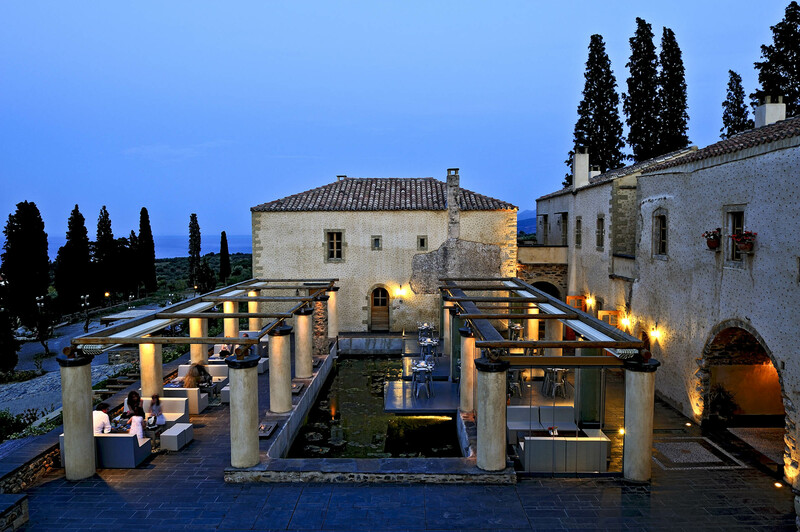 It’s in a quiet spot in the hills amidst olive groves and vineyards, from where it overlooks the sea and Monemvasia. The sea and places to swim are near, and if you drive a bit further you will find some excellent beaches. Kinsterna Hotel offers a boat service to take you (in 40 minutes) a beach which can only be reached from the sea. 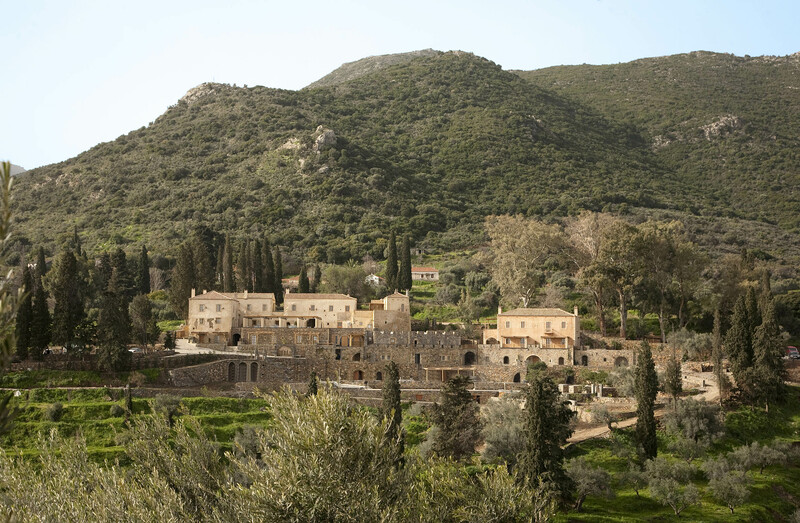 It is an approximately three to four-hour drive from Athens to Monemvasia (via Korinthos, Tripoli and Sparta). In Sparta follow signs for Gythio and after 24 km (about 18 km before Gythio) you turn left towards Krokees and Skala. 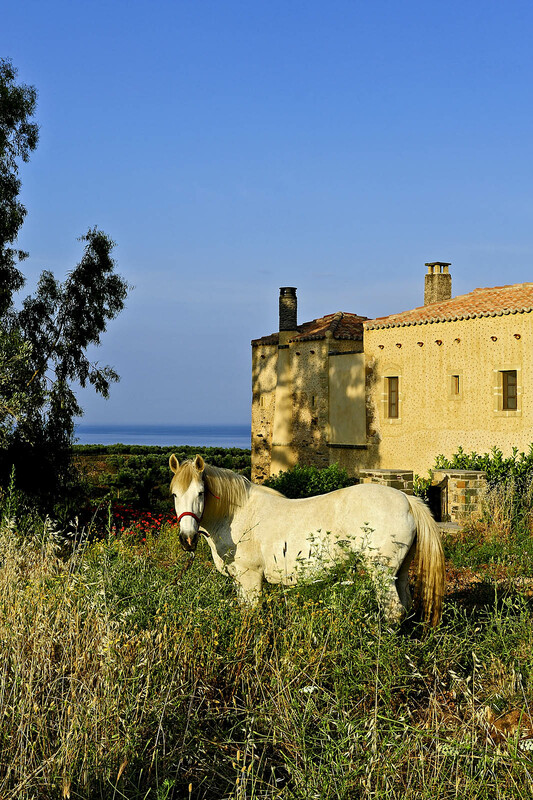 You follow the main road from Skala towards Monemvasia (50 km). 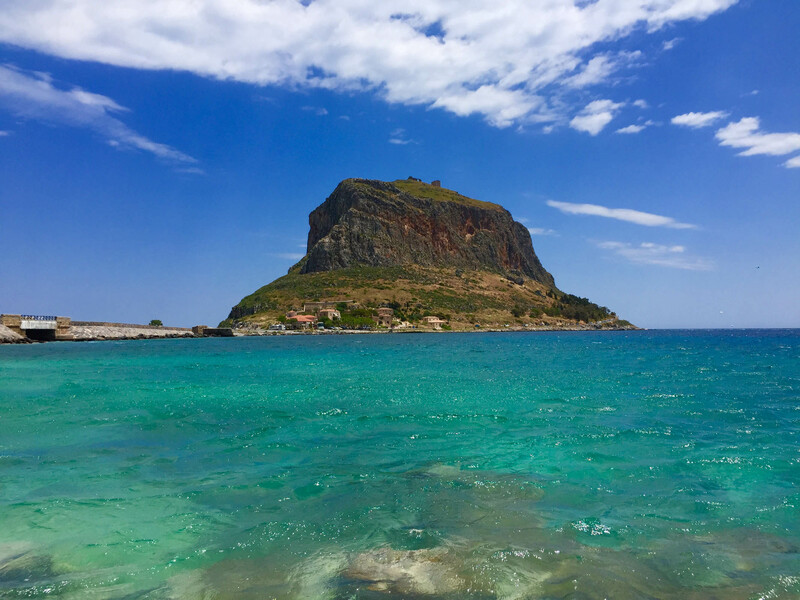 From Monemvasia take the coastal road south, first following signs for Neapolis then, after about 4 km, for Agios Stefanos. 1.5 km further on, turn right at the sign for Kinsterna Hotel. The last 2 km are on a narrow and partly unpaved country road.